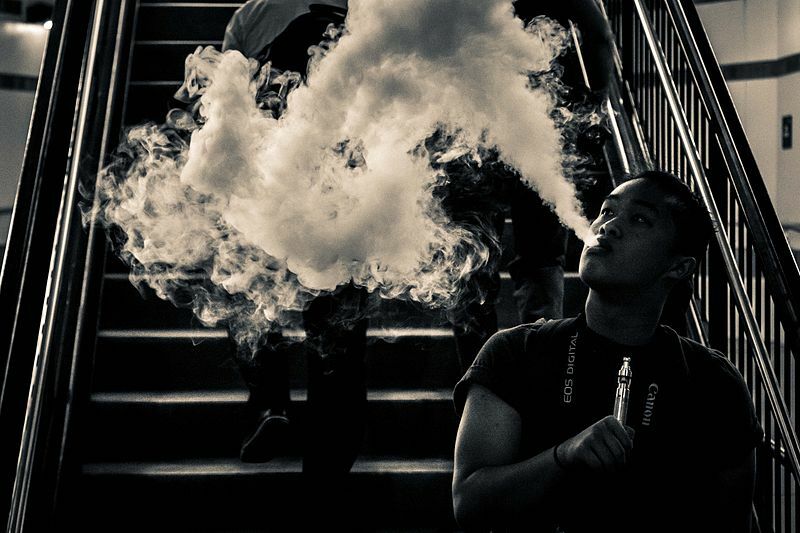 Are there passive smoking risks from e-cigarettes? <h2>Are there passive smoking risks from e-cigarettes?</h2><br /><p>Although e-cigarettes –&nbsp;battery-powered devices that deliver nicotine and flavourings to users – don’t contain tobacco, their emissions do contain nicotine, benzene and other carcinogenic compounds, according to Dr Esteve Fernández of the University of Barcelona and the Catalan Institute of Oncology, Spain.</p> <p>Dr Fernández is running the EU-funded TackSHS project which aims to find out more about the effects of second-hand emissions – whether from e-cigarettes&nbsp;or traditional cigarettes – on people’s health, taking into account differences in lifestyles, economic conditions and levels of legislation.</p> <p>‘Electronic cigarettes don’t produce combustion of tobacco – in fact they don’t even contain tobacco,’ he said. ‘But because most users use charges containing nicotine they do produce tobacco-specific nitrosamines which are carcinogenic.</p> <p>‘We know that the aerosols from e-cigarettes contain nicotine that can be assimilated by bystanders exposed passively to the aerosol and also benzene and other compounds present in the aerosol.’<span><br /> <div class="quote-view quotesBlock quote_vertical_right"> <div class="quotesTop"><img src="https://horizon-magazine.eu/sites/all/themes/horizon/images/quotes_top.png" alt="" title="" /></div> <p>‘We know that the aerosols from e-cigarettes contain nicotine that can be assimilated by bystanders.’</p> <blockquote><p>Dr Esteve Fernández, University of Barcelona, Spain</p></blockquote> <div class="quotesBottom"><img src="https://horizon-magazine.eu/sites/all/themes/horizon/images/quotes_bottom.png" alt="" title="" /></div> </div> <p></span></p> <p>The project, which started in November, will be looking at the different health effects produced by the aerosol emissions – often referred to as smoke or vapour even though they are in fact neither – from e-cigarettes.</p> <p>The study will also be examining the differences between electronic cigarettes and traditional cigarettes in terms of health, and also the best way of studying the impact of what is a relatively new product.</p> <p>‘In previous studies researchers have tried to study e-cigarettes as traditional cigarettes but this is an error,’ Dr Fernández said. The emissions from e-cigarettes not only contain different compounds to traditional cigarettes, but they may also be absorbed differently.</p> <p>Dr Fernández and the rest of the team will be carrying out their research by asking people in 12 European counties to complete surveys as well as by monitoring the levels of second-hand smoke in their environment.</p> <p><strong>Legislation</strong></p> <p>Information from the study should help decision-makers modify legislation to better protect the population, whether by protecting people from second-hand smoke by imposing stricter rules on, for example, smoking in outdoor areas near schools or hospitals or creating entire smoke-free environments such as university campuses.</p> <p>‘I believe our impact will be at the societal level. We want to produce information that will be used by decision-makers in order to modify legislation but not only that, to invest more in prevention and in information for the population,’ Dr Fernández said.</p> <p>Understanding more about the effects of e-cigarettes is particularly important in Europe, where the World Health Organization says 28 % of adults smoke tobacco, the highest level among its regions.</p> <p>E-cigarettes are often used by smokers of traditional cigarettes to help them quit. However, not only is little known about the health risks of using e-cigarettes, but there is also debate about whether they in fact encourage non-smokers to progress to smoking traditional tobacco cigarettes.</p> <p><img src="/sites/default/files/pictures/e-cigarettes.jpg" alt="Even though the most common reason for using e-cigarettes is to stop or cut down on tobacco smoking, 45 % of users surveyed did not reduce tobacco smoking at all." title="Even though the most common reason for using e-cigarettes is to stop or cut down on tobacco smoking, 45 % of users surveyed did not reduce tobacco smoking at all." width="614" height="549" class="@aligncenter@" /></p> <p>Another question is whether the process of refilling them exposes users to harmfully high levels of nicotine.</p> <p>Still, e-cigarettes are gaining popularity fast – Euromonitor last year estimated the e-cigarette market was worth almost EUR 5.5 billion worldwide in 2014 with 13 million users, mostly in the US and Europe – as big as the global market for fruit and herbal teas.</p> <p>In May 2016, the EU’s Tobacco Products Directive (TPD) came into force, which lays down rules governing the manufacture, presentation and sale of tobacco and related products, including e-cigarettes.</p> <p>Among other things the TPD banned companies from advertising e-cigarettes as a way to give up smoking and set limits for the amount of nicotine they could contain.</p> <p>Dr Constantine Vardavas of the European Network for Smoking and Tobacco Prevention (ENSP) is leading the EUREST-PLUS project, one of a number of projects funded under the Horizon 2020 programme to gather more evidence on the risks of e-cigarettes.&nbsp;He is aiming to take advantage of the new rules to assess the impact of public health legislation on the population.</p> <p>‘This was a wonderful opportunity to monitor the implementation of a public health policy across Europe and whether you see impacts on health,’ he said. ‘Can policy impact the actual population?’</p> <p>The researchers are following a group of subjects recruited before the new legislation came into force and will monitor them in the years to come to assess aspects including the effects of e-cigarettes on smoking behaviour, whether there is an increase in attempts to quit smoking, and the effects the legislation has on the perceptions of smoking.</p> <p><strong>Insufficient evidence</strong></p> <p>Dr Vardavas says that more information is needed on e-cigarettes. ‘It’s an area in which there is insufficient evidence and that is why we want to investigate how they modify smoking, whether the e-cigarette legislation to protect consumers and rules to protect non-users such as child-proof caps, actually have an impact on a population basis.’</p> <p>Even though Europe-wide legislation is in place, there are differences in the levels of regulation, for example on plain packaging or e-cigarette sales, between Member States, which gives the study a ‘natural randomisation’ which will be useful for the researchers, he says.</p> <p>‘We’re talking about a huge population – of 508 million people –&nbsp;being covered by one legislation so it’s very important to assess whether legislation protects public health,’ Dr Vardavas said.</p> <p>‘Our hypothesis is that if implemented appropriately across European Member States, the TPD will have a significant impact on public and population health,’ he added.<span style="font-size: 13.008px;">&nbsp;</span></p> <br /> <img src=”http://www.google-analytics.com/collect?v=1&tid=UA-40077089-1&cid=are-there-passive-smoking-risks-from-e-cigarettes&t=event&ec=republish&ea=read&el=are-there-passive-smoking-risks-from-e-cigarettes&cs=republish&cm=republish&cn=republish&cm1=1" /> This post <a href="https://horizon-magazine.eu/article/are-there-passive-smoking-risks-e-cigarettes.html">Are there passive smoking risks from e-cigarettes?</a> was originally published on <a href="https://horizon-magazine.eu/">Horizon: the EU Research &amp; Innovation magazine | European Commission</a>. As electronic or e-cigarettes grow in popularity, scientists are racing to find out how they affect health, not just of users but for those around them. Although e-cigarettes – battery-powered devices that deliver nicotine and flavourings to users – don’t contain tobacco, their emissions do contain nicotine, benzene and other carcinogenic compounds, according to Dr Esteve Fernández of the University of Barcelona and the Catalan Institute of Oncology, Spain. Dr Fernández is running the EU-funded TackSHS project which aims to find out more about the effects of second-hand emissions – whether from e-cigarettes or traditional cigarettes – on people’s health, taking into account differences in lifestyles, economic conditions and levels of legislation. ‘Electronic cigarettes don’t produce combustion of tobacco – in fact they don’t even contain tobacco,’ he said. ‘But because most users use charges containing nicotine they do produce tobacco-specific nitrosamines which are carcinogenic. The project, which started in November, will be looking at the different health effects produced by the aerosol emissions – often referred to as smoke or vapour even though they are in fact neither – from e-cigarettes. The study will also be examining the differences between electronic cigarettes and traditional cigarettes in terms of health, and also the best way of studying the impact of what is a relatively new product. ‘In previous studies researchers have tried to study e-cigarettes as traditional cigarettes but this is an error,’ Dr Fernández said. The emissions from e-cigarettes not only contain different compounds to traditional cigarettes, but they may also be absorbed differently. Dr Fernández and the rest of the team will be carrying out their research by asking people in 12 European counties to complete surveys as well as by monitoring the levels of second-hand smoke in their environment. Information from the study should help decision-makers modify legislation to better protect the population, whether by protecting people from second-hand smoke by imposing stricter rules on, for example, smoking in outdoor areas near schools or hospitals or creating entire smoke-free environments such as university campuses. ‘I believe our impact will be at the societal level. We want to produce information that will be used by decision-makers in order to modify legislation but not only that, to invest more in prevention and in information for the population,’ Dr Fernández said. Understanding more about the effects of e-cigarettes is particularly important in Europe, where the World Health Organization says 28 % of adults smoke tobacco, the highest level among its regions. E-cigarettes are often used by smokers of traditional cigarettes to help them quit. However, not only is little known about the health risks of using e-cigarettes, but there is also debate about whether they in fact encourage non-smokers to progress to smoking traditional tobacco cigarettes. Another question is whether the process of refilling them exposes users to harmfully high levels of nicotine. Still, e-cigarettes are gaining popularity fast – Euromonitor last year estimated the e-cigarette market was worth almost EUR 5.5 billion worldwide in 2014 with 13 million users, mostly in the US and Europe – as big as the global market for fruit and herbal teas. In May 2016, the EU’s Tobacco Products Directive (TPD) came into force, which lays down rules governing the manufacture, presentation and sale of tobacco and related products, including e-cigarettes. Among other things the TPD banned companies from advertising e-cigarettes as a way to give up smoking and set limits for the amount of nicotine they could contain. Dr Constantine Vardavas of the European Network for Smoking and Tobacco Prevention (ENSP) is leading the EUREST-PLUS project, one of a number of projects funded under the Horizon 2020 programme to gather more evidence on the risks of e-cigarettes. He is aiming to take advantage of the new rules to assess the impact of public health legislation on the population. The researchers are following a group of subjects recruited before the new legislation came into force and will monitor them in the years to come to assess aspects including the effects of e-cigarettes on smoking behaviour, whether there is an increase in attempts to quit smoking, and the effects the legislation has on the perceptions of smoking. Even though Europe-wide legislation is in place, there are differences in the levels of regulation, for example on plain packaging or e-cigarette sales, between Member States, which gives the study a ‘natural randomisation’ which will be useful for the researchers, he says. ‘We’re talking about a huge population – of 508 million people – being covered by one legislation so it’s very important to assess whether legislation protects public health,’ Dr Vardavas said. ‘Our hypothesis is that if implemented appropriately across European Member States, the TPD will have a significant impact on public and population health,’ he added.